Be always creative...And its very easy to be creative with eggs. Eggs are considered to be the beginners best ingredient in kitchen. Yaaah..its absolutely true..Many of my friends ask me to post recipe which is too simple that every one can cook it for breakfast, lunch or dinner. An omelette is the simplest recipe which can be done creatively and deliciously . I often noticed that many of us prepare omelette by mixing everything in whisked egg and then pouring it in the hot pan. Yaah , it is ok . But do try this recipe and am sure u will never repeat the old recipe of mixing every thing together. This omelette recipe is a very healthy breakfast recipe for school going kids and working adults. They wont get enough time to eat and enough time to cook too. Iam sure this recipe will solve both problems. We can prepare omelette in many ways. There are different varieties in omelette such as plain omelette, cheese omelette, Spanish omelette, chicken omelette, veg omelette, summertime omelette, 10 min omelette, tomato omelette, bread omelette and much more. 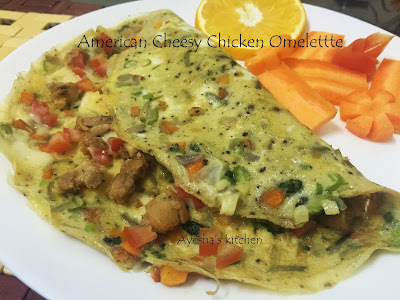 Here am sharing with you an American cheesy chicken omelette recipe. The name itself gives the main ingredients chart. Chicken , veggies and cheese are the main ingredients for this yummy omelette. An omelette that can be eaten for breakfast, lunch or dinner. So lets see how to make cheesy omelette / how to make American omelette/ how to make breakfast omelette. Melt butter in an omelette pan over medium heat and saute vegetables for about 2 minutes. Beat eggs, season with pepper powder and salt. Pour it into the pan covering the sauteed vegetables. And place a lid over the pan , let it cook. In a bowl, combine chicken with salad dressing / ranch dressing well . Now once the omelette has set and puffed slightly, carefully flip it. Spread the chicken mixture over the omelette, sprinkle cheese on top, followed by chopped tomato. Turn off heat and cover with a lid, allowing the cheese to melt. Now lift the lid, fold the omelette in half and serve.